I promise I'll be getting back to the #Blogember prompts starting tomorrow. 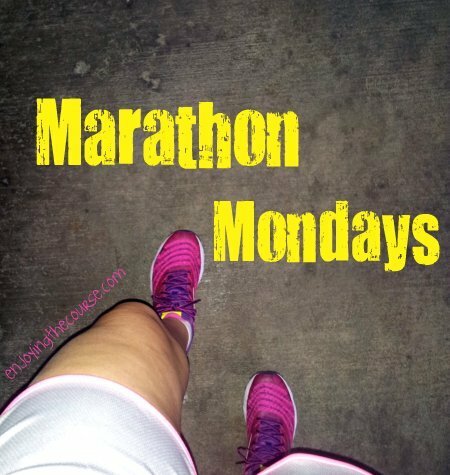 But today, it's time for an update on marathon training. Usually, I have no problem listening to my body UNTIL THERE IS RACE IN JUST OVER A WEEK!! This was probably one of the toughest training weeks. I think because the end is getting so close AND my shins decided not to play so nice. I can't pinpoint exactly when the shin pain started. I'm pretty sure it's been around for the last several runs, but I don't think it was around for my 18-miler a few weeks ago. But this past week it got bad. At first, my shins didn't really hurt at all when I was running - only afterward when I was doing my normal day-to-day walking (i.e. from my desk to the bathroom, etc). I ignored it for the most part and tried just running through it. I figured I'd continue with my training and use my TAPER time for the necessary healing. Then I tried to go for a 6 mile training run on Friday. I'd already decided to skip the speed aspect and just run for fun. It was not pretty. Not pretty at all. Even worse than the pain, though, was knowing I was facing a decision. Do I continue running through it, risking further injury, or do I rest, risking undertraining? Do I skip the half marathon? Do I skip the full? I still haven't decided what to do about the half on Saturday. I spent the weekend icing and rolling my lower legs, hoping for some relief and some healing. Last night I even broke down and ordered some Pro Compression marathon socks. I've heard great things about Pro Compression, so I'm kind of excited to try them out, but also nervous about wasting money if they don't help. My fingers are still crossed for a miracle this week. If no miracle comes, I'm still going to the race on Saturday. I'll volunteer instead. Last minute volunteers are always welcome, right? If no miracle comes, I'm still going to hold out hope for the full in December. Up this week? I'm not really sure. Continued icing and rolling, I'm sure. Maybe I should concentrate on some cross training and core work. Definitely lots of healing thoughts and hopes for a last minute healing miracle. Have you ever had to make the difficult decision to take a DNS due to an injury? If so, how did you deal with it? I completely feel your pain! I had to drop from a Full to a half due to an IT Band injury. It wasn't an easy decision but at the time, it was the best decision I could have made. I'm sorry you're dealing with this. Hopefully the compression socks will make a difference. Crossing my fingers for you!! Oh no! I hope you get better soon! Injuries are no good at all! Thanks, Susannah. I'm staying positive and hoping for the best. I am so sorry to hear about your shins, but here is what I can tell you. The same thing happened to me before a half in March and I took almost a full week off before the race and I PR'd. You've put in the hard work and you'll be ready so rest and if you don't feel a difference after the half, you can always pull out of the full. I do wear Pro Compression but if you have never worn them, you may want to do a test run with them first. I am sending healing thoughts and good karma your way! Keep icing and rolling. Thanks so much!! They are feeling tons better today. I'm hoping the socks will come soon (Wed?) that I'll have a day to wear them, a day to run in them, and maybe another day to run in them. Time will tell! Sending healing vibes your way Clarinda. I hope your shin pain goes away after you've taken some time off to rest. Oh no, I hope that goes away quickly! The socks ship super fast so hopefully they'll help you feel better. Would KT tape help or not? Just wondering.. I completely agree. It get hard at the end because you are just so tired, but stick with it! You are almost there. I broke down and got procompression socks a few months ago and I do think that they help in my recovery. I get a lot of foot swelling and lower leg soreness so it has definitely helped with that. I'm so sorry about your shins. I hope you'll still be able to run this weekend! I really like my pro compression socks, I hope they help you! I am very sorry to hear about the shins, but I might have something that can help you. Granted I am just guessing at what the problem may be, but I have a running coach who got me out of some severe shin pain a while back. I use a 2x4, but you can use a step too if you're careful. or use a large sturdy book.. Stand on it, placing the balls of your feet up on the step or block. Then slightly lower your heels, and then raise them. (Like you are standing on your tip toes, but not as high). Only do it, for the stretch, don't dip too low for pain, and don't lift too high for shin pain. Then 4 more reps of 20 each day. This exercise not only strengthens the shin, but will start stretching and getting you out of the pain. Additionally, icing is okay, but only for 15 min at a time, and it is okay to ice just before you run. Also, run on as flat of surfaces as possible for the next few days, and really warm up ahead of time even if that means walking a mile first before starting. When you start to run, go slow for the first 5 min, real slow, and don't pick up to your normal pace until you are 10-15 miles into your run. It also may not hurt to take a day or two off running, but keep up with the therapy for it. Sorry for the long post, good luck!!!! Thanks so much for you helpful advice! I should probably do more calf raises. Great reminder. :) The pain has already subsided greatly. But then again, I haven't tried running since Friday. I'm still crossing my fingers for Sunday.